303 Aerospace protectant still remains an obscure product despite its superior performance and the fact that it has been around a very long time. I was first introduced to 303 products by one of my RV customers who remains a huge to this day. Because of his passionate recommendation I was compelled to give this product a try in my real world of professional detailing. And years later not only do I remain a dedicated fan and user, but this product now resides on my list of "must have's"! If you are serious about protecting your toys and understand that everything you own is going to require a certain amount of maintenance, then you will want to entertain the idea of incorporating this product into your arsenal of products. It would be hard to find a person over the age of 15 who has not at least heard of Armor-All products. Most people associate Armor-All with tire dressing. And just like most companies, Armor-All continues to add more and more products to their line up. Due to its brand recognition, Armor-All is a natural starting point when people want to make a comparison between tire dressings, interior dressings, and protectants. 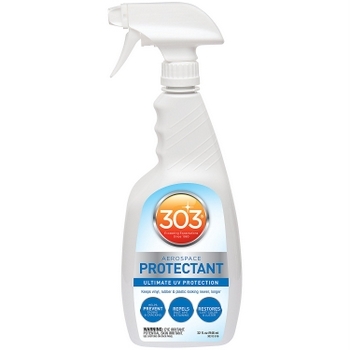 303 (30313-CSR) UV Protectant Spray for Vinyl, Plastic, Rubber, Fiberglass, Leather & More - Dust and Dirt Repellant - Non-Toxic, Matte Finish, 32 Fl. oz. A leader with a proven track record of protectants that truly perform. A company that has many products that deal with all types of materials in the maintenance and prevention of premature aging. After extensive "real-world" testing, has become one of my required products that I continue to find more and more applications for. To me, the one and only choice if you are debating between ArmorAll and 303 aerospace protectant. One of the most versatile products you will find with its ability to deal with so many materials, on both interior and exterior. If you make judgements based on "age" or seniority, then ArmorAll wins. If you prefer the shiny and greasy effect in your cars interior. "One of my favorite products ever" said no professional detailer...EVER!! Professional grade product for professional results. One of my "must-have" products. Versatility with the ability to use on so many materials, on so many types of cars, boats, RV's, etc. Not a glorified Band-Aid like ArmorAll that is going to be superficial at best. Treatment and protectant for all hard plastics, black trim, clear polycarbonate, treated leathers, dashboards, etc., etc., etc. The list seems almost endless once you start using this product and realize all the many materials used in manufacturing of boats, cars, and RV's. 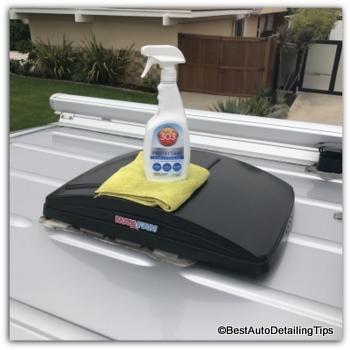 NOT intended for fabric/canvass convertible tops (for my recommendations on treating canvass convertible tops, see my auto upholstery protector where you can find the 303 fabric guard. Darren's Tips: The Bentley pictured above represents a perfect example of a car that has just about every type of material possible. When you start dissecting this example, you can start to appreciate the many uses of both types of the 303 products; cleaners, fabric guard, protectant. The actual fiberglass boat itself: hull, decking, etc. (this will go completely counter to everything most boat owners have heard or come to believe. This is not to suggest that you can't remain using wax or sealants on your boat as you likely have been, just know this product is suitable as a replacement for traditional waxes and sealants. What most people don't realize is that gel coat (fibergalss) is porous unlike car paint. (even though you have likely heard so-called experts talk about the pores of your cars paint. It is a topic that is endlessly debated.) The key factor is that gel coat is in fact a porous material and means that 303 Protectant is able to penetrate "into" the material. This may seem a complete contradiction since boats float on water and does not allow water to penetrate through the hull. This is where chemistry and molecular/nano science enter the picture, and most people simply do not understand the greater understanding of these subjects. Eisenglass (a glorified name for clear PVC) This material is typically used to make the clear "plastic" enclosures on power boats, fishing boats, yachts, electric boats, etc. The eisenglass (PVC) is simply the very thick, clear plastic used to created the semi-flexible window/door enclosures. In many ways this PVC is similar to gel coat in that it is "porous" to a degree, while being water tight, but the 303 protectant can penetrate the top layer to add protection against premature aging. (The 303 aerospace protectant shown on this page is intended for use on the clear plastic part of the eisenglass, not for the fabriuc that the eisenglass is typically sown to. For the fabric material of these window/door enclosures, you would need to see the 303 fabric guard located on auto upholstery protector. 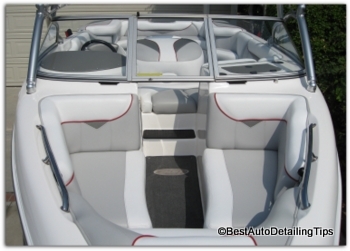 For boat covers, canvas materials, carpeting, that are more like traditional fabrics, please refer to auto upholstery protector for my review and recommendations in using 303 fabric guard to treat these porous materials. 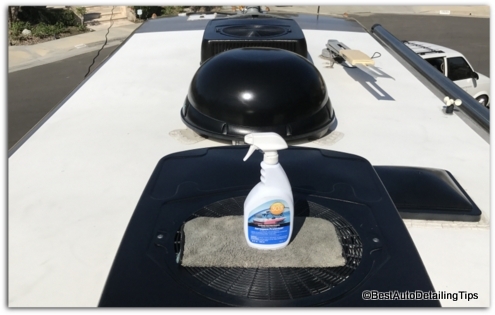 Darren's Tips: The electric boat shown here is a perfect example highlighting the many uses of all 303 Products that could be used in cleaning and protecting the many materials of this boat. 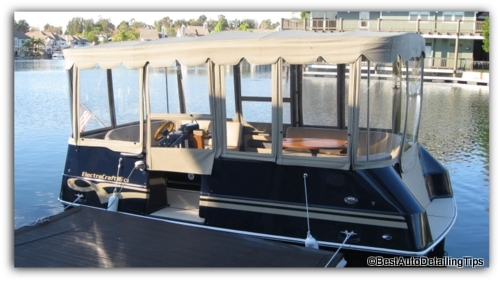 From the gel coat hull, eisenglass and fabric enclosure, vinyl upholstery, carpeting, fabric roof materials, etc. Virtually all roofs (the only exception I have found is on limited RV's with pre-painted white metal roofs. This is rare and represents the exception. Airstream trailers have these types of metal, white pre-painted roofs.) The typical roofs for most RV's are white gel coat, rubberized membrane, or textured fiberglass, of which all those roof materials would benefit from this product. Roof top accessories such as, but not limited to: solar panels, satellite dishes, TV antennas, sky lights, A/C covers, plastic exhaust vents, etc. If you have made it this far I imagine you are beginning to sense the "love" I have for the 303 Aerospace Protectant; along with their other products that can be found at the links I have also included on this page. I hope that you have not only learned a thing or two, but now have a professional grade product you can now test for yourself in your own world, on your own "toys"!